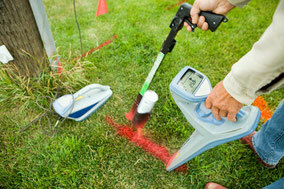 We follow a very specific set of rules to have your underground utilities located and marked, as specified by Alabama 811. 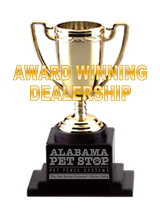 We will call at least 48 hours before installation is to commence, and will have documentation to verify we have complied with the rules and guidelines set forth by the state of Alabama. You can see those here: http://www.al1call.com/locate_call_info.html. 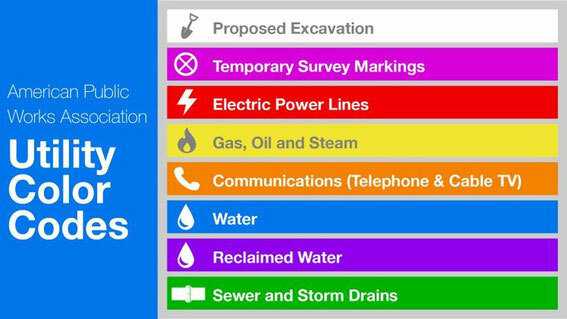 Underground utilities locating services have specialized equipment to help locate potentially dangerous or critical underground wiring and pipes, as specified in the color-coded chart below. They also have access to the utility boxes which allows them to mark those paths accurately. 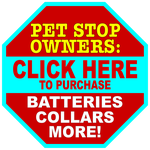 Pet Stop of Alabama has neither access to those utility boxes nor the authority to mark these utilities to avoid damage to them under this system. We must rely on the Underground Utilities Locating company contracted to perform those services in your area, and on your service providers to subscribe to Alabama 811. Click here to see whether your local utility service providers are members of the Alabama 811 network. If underground utility wires or pipes are unmarked, incorrectly marked, or buried at sub-standard depth, we will not be held responsible for any damage to them as we have no way to know if it has been done correctly. If we cut something and are aware of it, we will inform you and report the damage through the Alabama 811 system immediately.